After spending a successful 18+ years in the office on Welches Road (over 20 years in business! 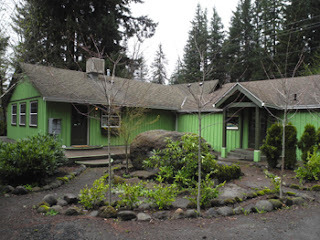 ), Betsy LaBarge, owner of Mt Hood Vacation Rentals, found a spacious and charming building on Highway 26 to be the new home for Mt Hood Vacation Rentals. With pride of ownership comes an open and welcome front office, a landscaped yard, incredible visibility from the highway, room to grow (read: increase our inventory of vacation homes) and a warm and private office space for Betsy (seriously, there’s a fireplace in there!). 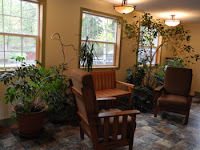 Cari and Emily S. in the front office look forward to greeting guests into the bright and inviting space, which features a comfy seating area flanked by well-loved plants. Housekeepers Dani and Emily R. have easier access to their own area, with double doors and more room for linens and supplies, a utility sink, and a prep table. Coby, our maintenance technician, appreciates having his own loading zone and storing all of his supplies in one accessible and well-organized area. Paul is eager to do some landscaping once summer hits. Thanks to Cari for organizing the big move, and thanks to the rest of the crew for all your heavy lifting, sorting, packing and unpacking. Not only are we moved, we are spring-cleaned and de-cluttered! Just in time for the busy season of summer to start. Bring it on. You can’t miss us! The NEW Mt Hood Vacation Rentals is located at 67898 E Highway 26 in Welches, Oregon, just west of the stop light at Welches Road. 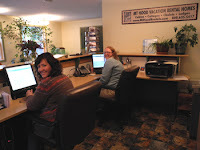 Stop in, say hi and see our new digs.